Day 03: Kathmandu - Lhasa (3650m) Early morning after breakfast drop to the international airport for fly to Lhasa. The flight duration is 1 hr and 10 min and it is one of the most beautiful flights in the world. On your flight you will see the Yarlung Tsangpo River, Lake yamdruk, Kanchanjunga, Makulu pumori, as well as Mount Everest the highest mountain in the world including other mountain peak. UPON ARRIVAL you will be meet our Tibetan Guide in gong kar Airport and transfer to Lhasa city 90 km. Overnight in Hotel. Day 04: Sightseeing around Lhasa. In the morning visit to Potala Palace and PM Visit Jokang temple, Barokor market. Overnight in hotel. Day 05: Sightseeing in Lhasa. In the morning visit to Drepung monastery and PM Visit Sera monastery. Overnight in hotel. Day 06: Lhasa - Gyantse (3950m): 261km Drive to Gyangtse via Yamdrok holy lake with a few drops of snow peaks. This drive takes approx 8 hrs crossing two passes the korala (5010m) and kambala (4794m) and lake yamdrok tso. You will cross Yarlung Tsangpo River. Overnight in hotel. Day 07: Gyantse - Xigatse (3900m): 90 km Morning Visit to Palchoe monastery and Kubum Pagoda stupa in Gyangtse and after lunch embark on a pleasant 2 hrs drive to Xigatse. Second biggest city of Tibet.same day visit to Tashi Lhunpo monastery. Overnight in hotel. Day 08: Xigatse - Shegar (4350m): 244 km Early morning drive to Shegar approx 8 hrs. On the way we visit Sakya monastery then drive to Shegar. Overnight in hotel. Day 09: Shegar - Rongbuk (4920m)): 145 km Drive to Rongbuk. This day we have drive around 145 km and over rocky terrain. Overnight in hotel. Day 10: Sight trip to Base Camp (5590m). 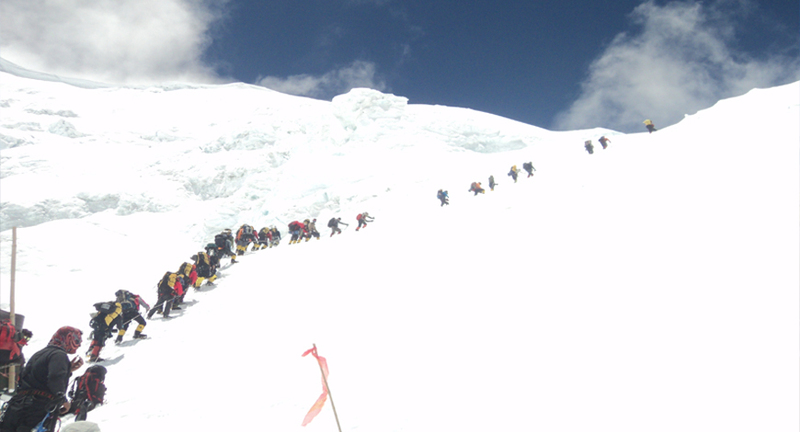 Drive to Base camp then trek 2 hrs will lead you the base of the highest peak on earth- The North face of Mount Everest. Afternoon back to Rongbuk overnight in hotel. Drive back to Old Dingri. Overnight in hotel. Drive to Nyalam. It takes approx 8 hrs downhill to Nyalam crossing two spectacular passes -The Lalungla (5082m) & Nyalam (3800m) Pass. Overnight in hotel. Drive downhill to Friendship Bridge via Zangmu. Drive back Kathmandu overnight in Hotel.